The Bethany Leapley Autism Spectrum Disorder Scholarship Fund supports scholarships for members of the Autism Spectrum Disorder (ASD) Fitness Center in Orange, CT. The ASD Fitness Center is a facility designed specifically to provide a safe, comfortable and structured environment for empowering individuals with ASD to improve their level of physical fitness. Scholarships are awarded for a six month period of time. 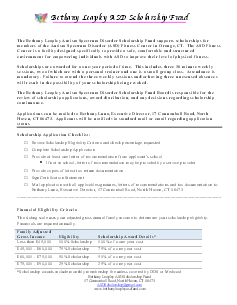 The Bethany Leapley Autism Spectrum Disorder Scholarship Fund Charity Board is responsible for the review of scholarship applications and award distribution.